Hi, need to keep this short and sweet, have to get up early to go to work. More about the kind of week I am having on tomorrow's post! 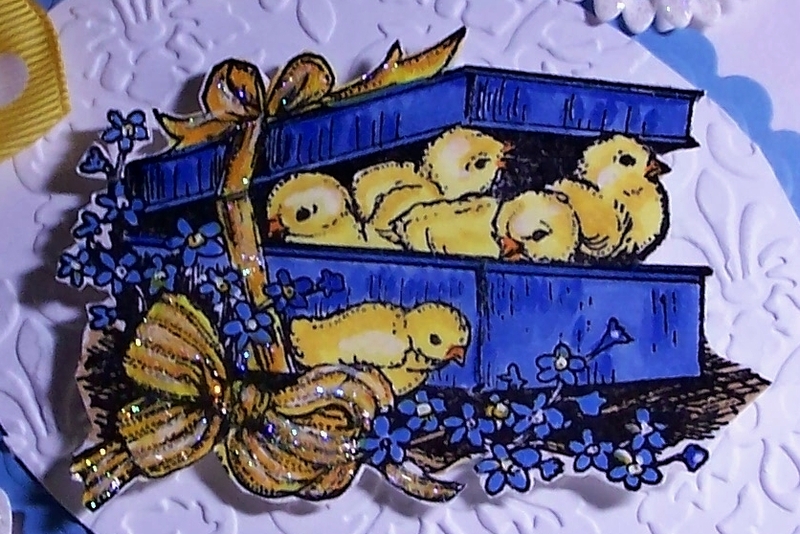 This cute gift box of chicks is by Northwoods Rubber Stamps. The base card is yellow textured card stock. The daisies are from K & Company. Kaiser Pearls. Image is colored with Copics. Star Dust Stickles on flowers and bow on box. Nestie die cuts used for ovals and decorative half circles. Bow is from AC Moore. Sentiment is Penny Black. Lovely card, love those Daisy's, too cute!! Wow Sue...you are knocking your cards out of the ball park. I adore that sweet little image. Thanks so much for playing the Midnight Madness sketch challenge. What a fabulous rubber stamp. 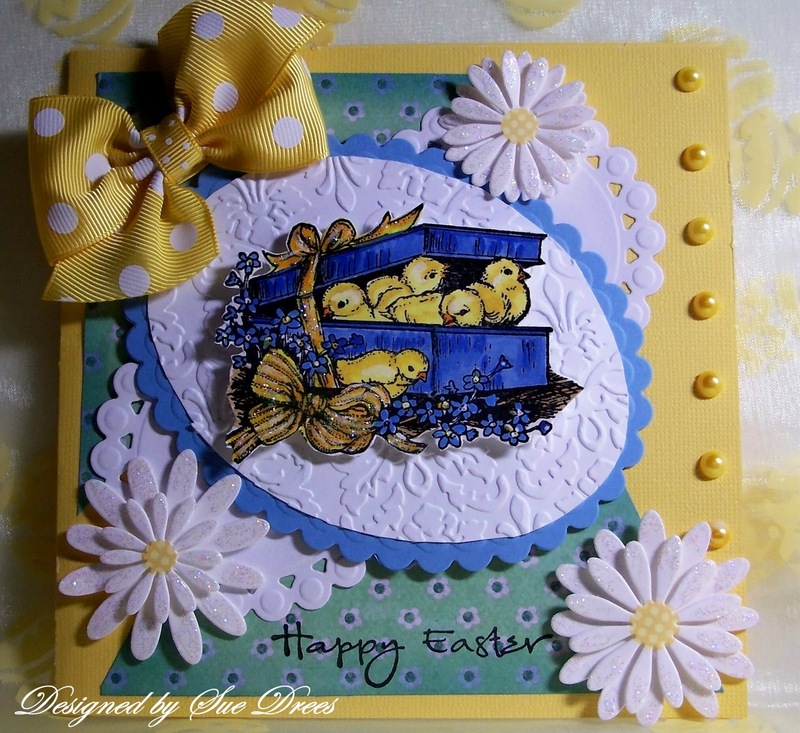 I love the bright and cheerful colours you have used to make such a fabulous card! Thanks so much for joining us on the Midnight Madness sketch challenge. wauwwww sooo cute lovely card!!!! What a adorable card Sue! Your image is so sweet, and its beautifully colored :-) Great take on the sketch this week! Thank you so much for sharing your card with us at the Midnight Madness Sketch Challenge. I love your take on the sketch, Sue! And you used my favorite colors and flowers, how thoughtful of you! Beautiful card! Really REALLY cute Sue - love that bow - it goes soo well with that gorgeous image! this is gorgeous sue this is a winner at mmsc. great image and coloring, love the flowers too. Sue, this is such a gorgeous Easter card! Your little chicks are just adorable and I love the embossing, your daisies and that yummy bow! Thanks so much for joining us for this week's Midnight Madness Sketch Challenge, we hope you will come back and play again next week! This is such an adorable Easter Card. I love the colors you chose and those chicks are just too Cute. Thanks for sharing with us at the Midnight Madness Sketch Challenge. Sue this a lovely, lovely card!! Rich colors and a precious image!! The MMDesign Team thanks you for joining us this week! 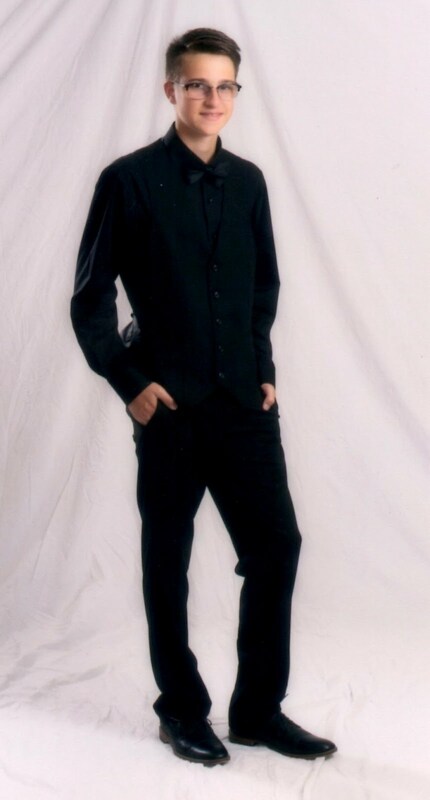 I just had to come by to see your spring picture of NF. Surely not a disappointment...it is amazing and so full of spring goodness. You card is fantastic. I just love the daisies and it is colored so beautiful. Lots of inspiration here. Wishing you joy and happiness. This is so pretty Sue! Love the chickens! Your flowers are very pretty and I love the big bow!Thank you for sharing with us at Midnight Madness. I hope you will play with us again next week! Absolutely gorgeous card, Sue! What a beautiful image! Thanks so much for playing along with us at the Midnight Madness Sketch Challenge! How delightfully adorable. I love your chicks! So cute! Thank you for joining us for this weeks sketch challenge at Midnight Madness. Wow! This is fabulous. Love your take on the sketch and your gorgeous bow! WOWZERS Sue, this card is just darling! Beautiful colors, sweet image and the details are gorgeous. Love the polka dot bow and the flowers! Totally gorgeous! Thanks for joining us again this week. Hi Sue! Wow such a lovely card. Your layering is wonderful. Thanks so much for joining us this week at midnight madness!